Rasputin ballet is a part of an annual celebration organised by the High Institute of Ballet. Born in 1979, Hany Hassan is one of the leading dancers at the Cairo Opera Ballet Company. He is known for many outstanding roles that he performed over that past 17 years. His performance of Zorba, in Zorba the Greek by Nikos Kazantzakis, performed by the Cairo Opera Ballet Company, has brought him particular recognition. On 18 April, Hassan will present the Rasputin, a ballet directed and choreographed by himself. The performance will take place at the Cairo Opera House, Main Stage and represents Hassan’s debut as a director in front of a wide audience. The character of Grigori Rasputin (1869 – 1916), a crazed monk, and one of the most scandalous figures in Russian history, became close to the Russian Emperor Nicholas II, his wife Alexandra and their son Alexei. Some believe that he has played a significant role in helping to end the tsarist rules in Russia. As he became the most influencial man in the Russian governmental circles, many true stories and legends about Rasutin became inspiration to many artists: painters, filmmakers and musicians. Hassan chose to perform one from two acts from Rasputin ballet, a 60 minutes work that he was preparing over the past year and half. “I have been already directing smaller ballet works but all that was limited to performances at the ballet Academy, festival’s openings and video clips,” Hassan tells Ahram Online. In his work, Hassan uses stage and screen while looking at the influence of Rasputin. He cleverly molds his actual presence on the stage and sensation of ghostly absence, which nevertheless does not diminish the influence that he has on all the protagonists. Hassan points out that the Cairo Opera Ballet Company consists of almost 90 dancers. However, he adds that with only one ballet performed every three months, mostly by to 50 or 60 dancers, the remaining dancers often remain unutilised for several months at a time. “Not only those young people are at the Cairo Opera’s payrolls, but they also need to have a chance to practice and present their skills. Smaller performances involving smaller casts are an important addition to the main repertoire of the ballet company,” Hassan underlines. 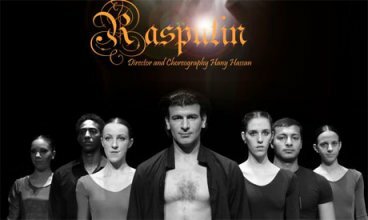 Rasputin is based on five leading roles, with Hassan being protagonist (Rasputin) in addition to a small group of additional dancers, core de ballet. Most of the dancers are from the Cairo Opera Ballet Company, with a few coming from the Ballet Academy. Hassan hopes that Rasputin will be one of the first performances that will engage many young dancers, not only at the Cairo Opera stage but will move to Gomhoria Theatre and will also reactivate Alexandria performances venues. Rasputin is a production that practically did not involve much extra costs from the Opera House. Costumes and décor are adjusted from other works performed at the Opera stages. “I do not mind using second hand costumes and scenography elements, as long as it helps us remain active and creative. During the months that we are worried about ballet being an art form that can be controversial to many religious trends in the country, it is important that we insist on our presence and keep performing,” Hassan says. He adds that initiatives such as Rasputin are relatively easy to relocate and hopefully will eventually reach audiences outside Cairo educating them about values of this art form. Rasputin directed by Hany Hassan will be performed on Wednesday 18 April at the Cairo Opera House Main Hall, at 8pm.